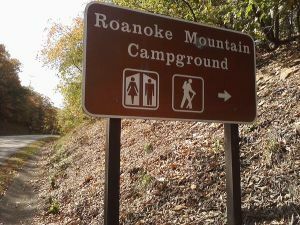 At Milepost 120.4 on the Blue Ridge Parkway you can find Roanoke Mountain Campground with 74 tents and 30 RV/trailer sites, with 3 sites that are handicap-accessible. All sites are first come, first served. Facilities include water, comfort stations with flush toilets and sinks but no showers or hook-ups. There is a 4 mile one-way loop road nearby (campground is not accessible from loop road) where overlooks can be found with a view of Roanoke, the largest city along the Parkway corridor and Mill Mountain. The loop road contains steep grades and trailers are not allowed. Some picnic tables are available at the overlooks on the scenic loop. For information, call (540) 342-3051. 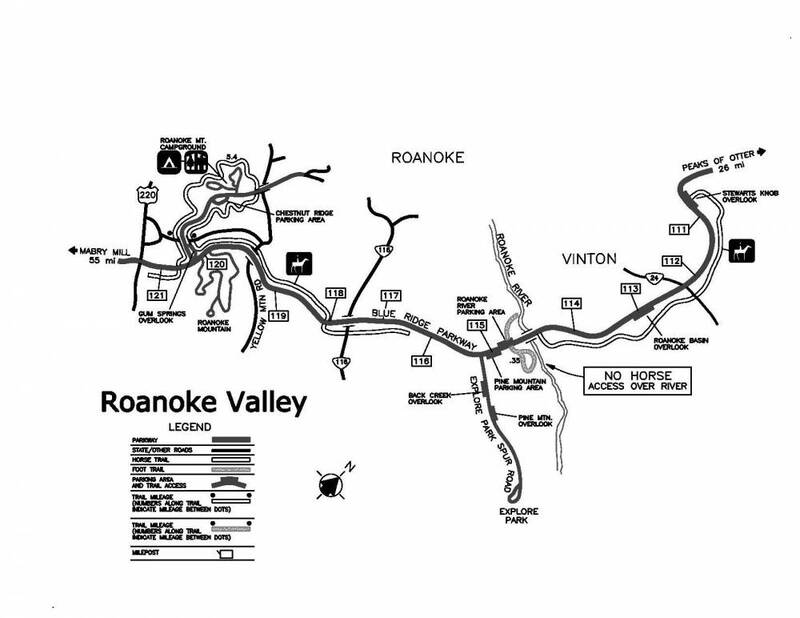 Area hikes include: Roanoke River Trail, Roanoke Mountain Summit Trail, Chestnut Ridge Trail (adjacent to campground), Roanoke Valley Horse Trail, and Buck Mountain Trails. 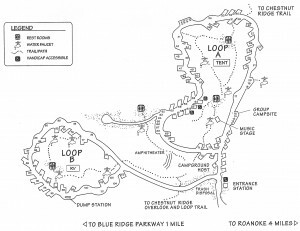 Roanoke Mountain Campground on the Blue Ridge Parkway along the Mill Mountain Spur Road (milepost 120.4) has sites for 74 tents and 31 trailers (3 sites are handicap-accessible). Facilities include water, comfort stations with flush toilets and sinks but no showers or hook-ups. The campground is located near downtown Roanoke. This is the only Parkway campground that is located so close to an urban area. 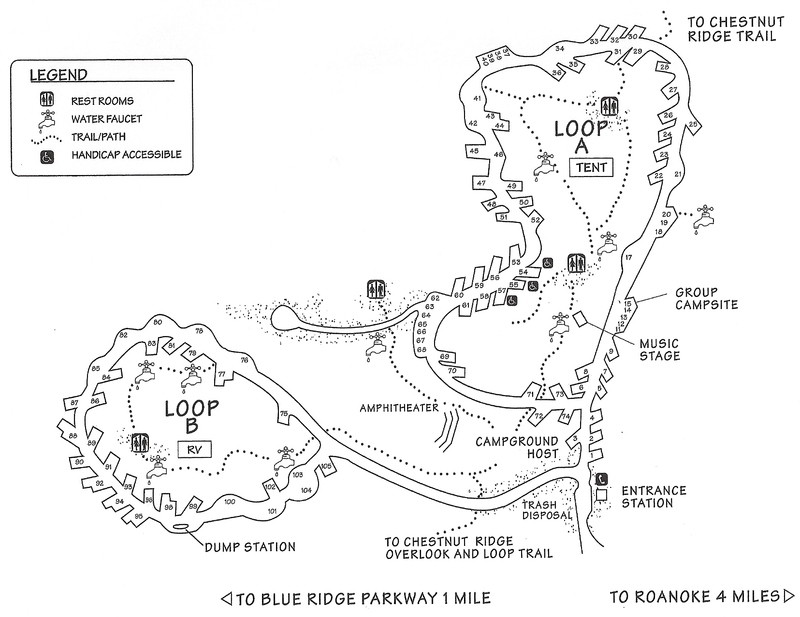 The cost is the usual Blue Ridge Parkway camping fee of $16. The campground is normally open mid May to the end of October. Because it is so near to the city, the campground can become very crowded at times. Several sites of old iron mines are located near the campground. Local musicians perform traditional and bluegrass music on Sunday evenings from June through October. There is a nature trail located in the campground plus the very popular Chestnut Ridge Trail that loops around the campground.